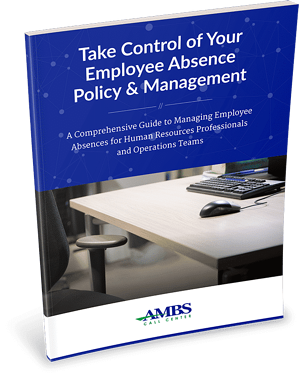 A comprehensive guide to managing employee absences and reporting for human resources professionals and operations teams. Employee absenteeism, both planned and unscheduled, can have drastically negative effects on an organization. It causes a snowball effect on the overall productivity and efficiency of a company. Download this guide to learn how your human resources department can improve employee absence management. What does an unplanned absence cost my organization? Why can absenteeism increase administrative expenses? What can an effective employee abcense policy do for my managers? How can an employee reporting service help increase productivity? How does Ambs manage employee reporting services?